Authored by: Justin T. Gass, Ph.D. and Christine Adamec; Consulting Editor: David J. Triggle, Ph.D. Although drinking alcoholic beverages is legal for those 21 years and older in the United States, alcohol is a dangerous drug when misused or abused by those of any age. One of the most commonly used drugs among teens and adults, alcohol affects areas of the brain that influence pleasure, impulses, and coordination. Though moderate, social use of alcohol can have a beneficial effect on health, drinking to excess can lead to headaches, nausea, severe memory loss, or even death from alcohol poisoning or accidents. Long-term abuse of alcohol has devastating effects on one's health and can be fatal to the user. 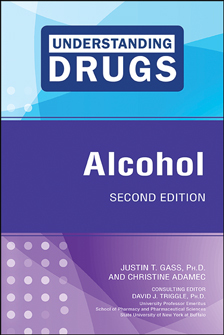 Alcohol, Second Edition explains all sides of using this powerful social lubricant. Dr. Justin T. Gass received his bachelor's degree in psychology from East Tennessee State University. His graduate work was in the field of neuroscience, and he received his Ph.D. from the University of South Carolina, Columbia. He is currently an Assistant Professor in the Department of Neuroscience and Alcohol Research Center at the Medical University of South Carolina, Charleston, where his research in the field of drug addiction is supported by a grants from the National Institute on Alcohol Abuse and Alcoholism and the U.S. Department of Defense. Christine Adamec is a freelance writer and author who has written and coauthored books for Facts On File about substance abuse and addiction, including The Encyclopedia of Alcoholism and Alcohol Abuse, The Encyclopedia of Drug Abuse, and The Encyclopedia of Addictions and Addictive Behaviors. She has also authored books for Chelsea House Publishers about opium, amphetamines, barbiturates, and phencyclidine (PCP).